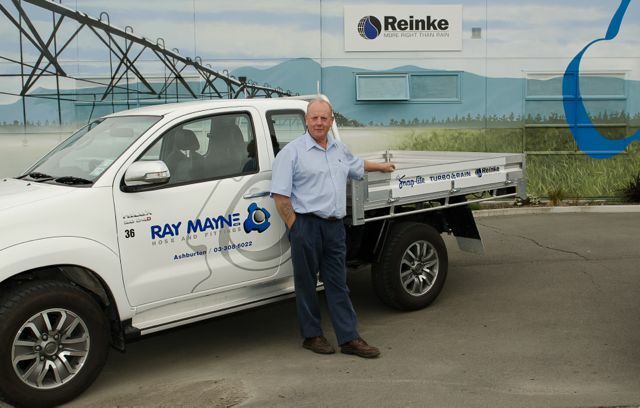 Ray Mayne Hose and Fittings Ltd is a privately owned irrigation company based in Ashburton, Mid Canterbury. The company was formed in 1991 and currently employs 20 staff. We specialize in irrigation design, installation, manufacture and importing of irrigation equipment. Our client base extends from Gore, Southland, to Whakatane, Bay of Plenty. Ray Mayne Hose and Fittings Ltd is the New Zealand importer of Reinke Irrigation Equipment from Nebraska, USA. We import Snap-tite Irrigation products from the USA and Europe. Ray Mayne Hose and Fittings Ltd manufacture the TurboRain brand of large travelling irrigator, and we are a distributor for the Pleuger range of Submersible Irrigation pumps through Flowserve Pumps Ltd. Founded in 1954, Mr Richard F. Reinke formed the company on a family farm and began manufacturing farm and commercial building structural components specializing in chicken houses and laminated rafters. During the late 60's, Reinke introduced the ELECTROGATOR® center pivot irrigation system. The first reversible, electric drive center pivot with collector ring allowing continuous rotation and span over 100 feet in length with a patented V-jack truss design. These designs are now used worldwide by all major manufacturers of center pivot and lateral move irrigation systems. For more information on how Richard Reinke changed irrigation click here.